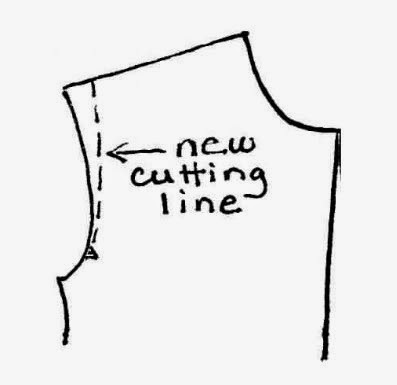 Fabric Mart Fabricistas: Pretty Peplum Top Sew Along: Stay Tape and Sewing Begins! Pretty Peplum Top Sew Along: Stay Tape and Sewing Begins! Are you ready to start sewing? We will do a little bit of sewing in this step, but not as much as you would probably like! This pattern calls for a 1/4" seam allowance, a little different that your average pattern. But what you may find is that you end up using larger seam allowances as you fit the top on your body. If you're comfortable, you can make the entire top using a serger. When I make a garment for the first time, I do not use my serger till it is fit the way I want because pulling out serger threads are really annoying! Before we get started, you need to watch this video on stay tapes. This will ensure better looking finished garments. You can also view a tip sheet Pamela created to help you better understand the various stay tapes. Click here to view and print! While SewkeysE is the company Pamela recommends, don't fret, other stay tapes will work fine for the shoulder seams. I didn't have this brand of stay tape on hand when I first started making the top and they turned out ok! But on my last top, I used SewkeysE and I would definitely recommend it! After you have selected the best 1/2" stay tape, sew or fuse the stay tape to the wrong side of the FRONT piece. You want the stay tape to line up with the edge of the shoulder line, like shown in the video. You will be sewing through the stay tape when you sew the shoulder seams. Try on the garment prior to putting in the sleeves. 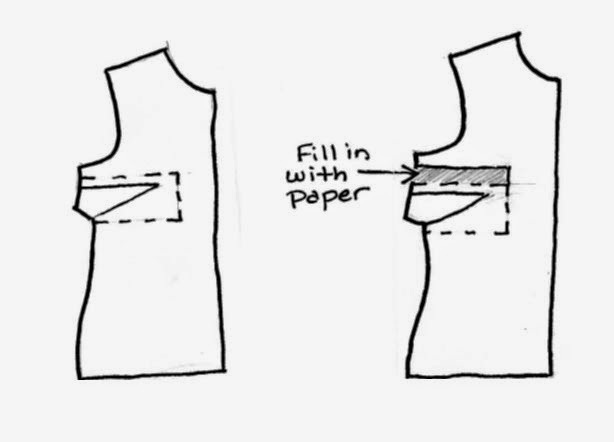 Make sure the seam line of the garment is right on the end of your shoulder bone. If it hangs over the edge of your shoulder, trim away the excess fabric, tapering to nothing at the armhole notches. Use Pamela’s Patterns “Curvey” ruler to true the curve. Make the changes to the Front and Back pattern piece. As long as this adjustment isn’t more than 5/8”, the sleeve ease should be fine. Check the placement of the dart. Re-position the dart if it is too high or too low on your bust. Pamela has provided a great tip on how to re-position a dart. On the pattern, draw a “three sided box” around the existing dart. This should be just slightly larger than the dart. Cut out the box. Slide the “dart box” down the desired amount. Fill in the gap above the dart with pattern paper and tape in place. True up the side seam. Once you have the shoulders and dart taken care of, sew on the sleeve pieces, matching the notches. Press seam allowance toward sleeve. That's it for now! On Thursday, February 12th, we will work on the proportions and getting the right fit for your top. If you have questions or problems, please ask! I will try my best to answer them and if I can't, I will be sending them to Pamela for advice. Be patient with a response, as I need to hear back from Pamela first before the answer will be posted. So if I don't have the Sewkeys tape I can just use some Dritz tape? That's basically all they have in the stores. Not sure how long it will take for the other kind to arrive. You can use whatever type of stay tape you can find. You will be fine using whatever you find for the moment and then if you decide to purchase SewkeysE stay tape for future projects, that will be fine! I actually didn't even use stay tape for my first practice top and I was fine. The stay tape does give a better finish, but you will be ok with whatever you can find. Is Dritz Seams Great the same as stay tape? Yes, it is one of many types of stay tape. Hi-I am to new to Fabric Mart so just found your post on the peplum top. Which pattern are you using?